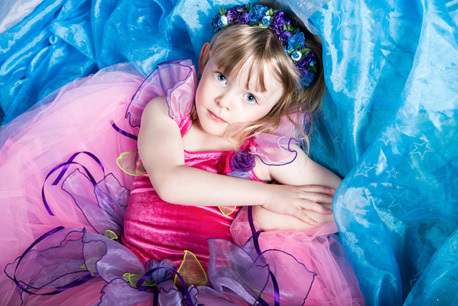 We and the fairies have been into children's creative design and dance wear for about 20 years. Who are we and why did we get involved in this wonderful enchanting mystical and magical enterprise? My name is Krista and together with my supportive and encouraging husband Gerard I decided to design and craft some of my own range in fairy and dance wear. As I was some what disillusioned with what my family and friends had to choose from the existing retail market, I spent a lot of time applying air brush colour and fairy dust and asking my self as an adult and child what I would like to wear to help me dream and live in the world of make believe. I must point out that from time to time that beautiful creature the wine fairy helped me greatly and you could quite easily say that I was sometimes off with the fairies. This also applies for my current state. This was all good because as a result the wings, halos, headbands etc were born. Together with my fairy good friend Fran and some other fairies we sit in secluded parts of the house and design and make some of what you see. I must tell you that most of the family and friends glitter whether they want to or not. This is also the case with my dog Benny as he wanders into the studio sometimes. And if you asked Gerard he would tell you that you would be truly amazed as to where and what sparkles at night but we wont go there. I must add that my niece Kerri Anne my nephew Aaron and last but not least Kerri Anne's partner Pierre helped us so much to get this site up. Pierre is the wizard when it comes to setting this up. We truly believe at fairy dance that imagination has no boundaries and would like to thank you for giving us the opportunity to be creative and for supporting us.